Songwriter royalties have always been a pain point for streaming, especially in the US where statutory rates determine much of how songwriters get paid. The current debate over Spotify, Amazon, Pandora and Google challenging the Copyright Royalty Board’s proposed 44% increase illustrates just how deeply feelings run. The fact that the challenge is being portrayed as ‘Spotify suing songwriters’ epitomises the clash of worldviews. The issue is so complex because both sides are right: songwriters need to be paid more, and streaming services need to increase margin. Spotify has only ever once turned a profit, while virtually all other streaming services are loss making. The debate will certainly continue long after this latest ruling, but there is a way to mollify both sides: price increases. When Spotify launched in 2008, the industry music standard for subscription pricing was $9.99. So, when its premium tier was launched in May 2009, it was priced at $9.99. Incidentally, Spotify racked up an initial 30,000 subscribers that month – it has come a long way since. But now, nearly exactly ten years on, Spotify’s standard price is still $9.99. Its effective price is even lower due to family plans, trials, telco bundles etc., but we’ll leave the lid on that can of worms for now. Over the same period, global inflation has averaged 2.95% a year. Applying annual inflation to Spotify’s 2009 price point, we end up at $13.36 for 2019. Or to look at it a different way, Spotify’s $9.99 price point is actually the equivalent of $7.40 in today’s prices when inflation is considered. This means an effective real-term price reduction of 26%. Compare this to Netflix. Since its launch, Netflix has made four major increases to its main tier product, lifting it from $7.99 in 2010 to $12.99 in 2019. Crucially, this 63% price increase is above and beyond inflation. An inflation-adjusted $7.99 would be just $10.34. Throughout that period, Netflix continued to grow subscribers and retain its global market leadership, proving that there is pricing elasticity for its product. So why can’t Spotify do the same as Netflix? In short, it is because it has no meaningful content differentiation from its competitors, whereas Netflix has exclusive content and so has more flexibility to hike prices without fearing users will flock to Amazon. If they did, they’d have to give up their favourite Netflix shows. Moreover, Netflix has to increase prices to help fund its ever-growing roster of original content, creating somewhat circular logic, but that is another can of worms on which I will leave the lid firmly screwed. If Spotify increases its prices, it fears its competitors will not. Likewise, they fear Spotify will hold its pricing firm if any of them were to increase. It is a classic prisoner’s dilemma. Neither side dare act, even though they would both benefit. Who can break the impasse? Labels, publishers and the streaming services. If they could have enough collective confidence in the capability of subscriptions over free alternatives, then a market-level price increase could be introduced. Rightsholders are already eager to see pricing go up, while streaming services fear it would slow growth. Between them, there are enough carrots and sticks in the various components of their collective relationships to make this happen. However – and here’s the crucial part – rightsholders would have to construct a framework where streaming services would get a slightly higher margin rate in the additional subscriber fee. Otherwise, we will find ourselves in exactly the same position we are now, with creators, rightsholders, and streaming services all needing more. When Netflix raises its prices it gets margin benefit, but under current terms, if Spotify raises prices it does not. The arithmetic of today’s situation is clear: both sides cannot get more out of the same pot of cash. So, the pot has to become bigger, and distribution allocated in a way that not only gives both sides more income, but also allows more margin for streaming services. Streaming music in 2019 is under-priced compared to 2009. Netflix shows us that it need not be this way. A price increase would benefit all parties but has to be a collective effort. Where there is a will, there is a way. Digital music revenue share: A common refrain from songwriters and the bodies that represent them (music publishers, collection societies etc.) is that everything starts with the song. And of course it does. However it is the recorded version of the song that most people interact with most of the time, whether that be on the radio, on a CD, a download, a stream or a music video. This has helped ensure that record labels – usually the owners of the recorded work – hold the whip hand in licensing negotiations with digital music services. Labels have consequently ended up with an average of 68% of total on-demand streaming revenue and publishers / collection societies just 12%. The labels’ share is 6 times bigger. Publishers are now actively trying to rebalance the equation, often referred to as ‘seeking out a fair share’. For semi-interactive radio services like Pandora the ratio is roughly 10:1. Artist income: While music sales declined over the last 10 yeas, live boomed. And although there are signs the live boom may be slowing, a successful artist can now typically expect to earn as little as 9% of their total income from recorded music, compared to 57% from live. Again, a factor of 6:1. There are many complexities to the revenue split, such as the respective deals an artist is on, fixed costs etc. but these splits tend to recur. Ironically just as everything starts with the song for digital music, everything starts with the recorded work (and the song) for the live artist. The majority of an artist’s fan base will spend most of their time interacting with the recorded work of the artist rather than live. The recorded work has become the advert for live. In fact the average concert ticket of a successful frontline artist costs on average 8 times more than buying their entire back catalogue. Thus for fans the ratio is even more pronounced at 8:1. Free music users: The freemium wars are dominating the contemporary music industry debate. Spotify and other services that have on demand free tiers are under intense scrutiny over how these tiers may be cannibalising music sales. 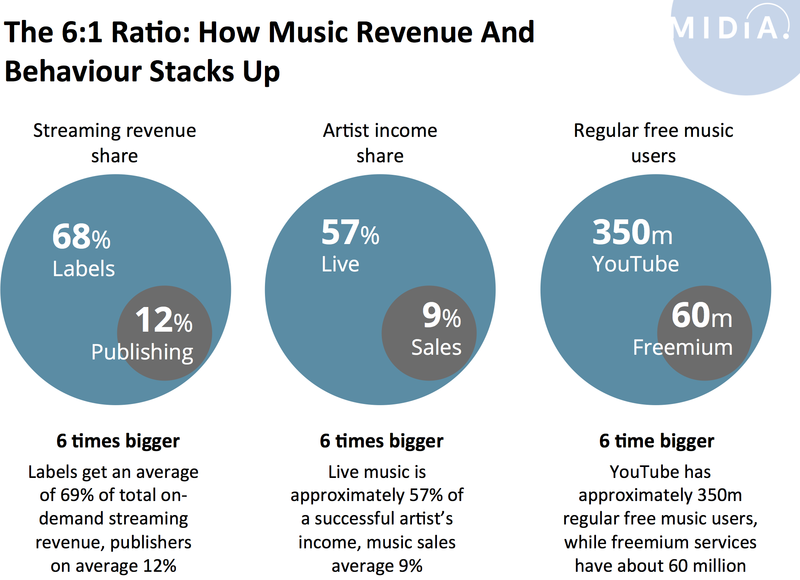 However YouTube’s regular free music user base is about 350 million compared to approximately 60 million free freemium service users across all freemium services. Again a ratio of 6:1. Whatever the impact freemium users may be having, it is 6 times less than YouTube. The music industry has never been a meritocracy nor will it ever be one. So it would be fatuous to suggest equality is suddenly going to break out. However there will be something of a righting process in some areas, especially in the digital music revenue share equation. Most significantly though, these ratios are becoming the foundational dynamics of the new music industry. These are the reference points that artists, rights holders, and all other music industry stakeholders need in order to understand what their future will look like and how they can help shape it. NOTE: This post was updated to reflect that the songwriter ratio is actually 10:1 for semi-interactive radio. The 2:1 ratio applies to label revenue versus collection society revenue, which includes revenue for performers who are often but not always also the songwriter.